Yesterday Morgan and I caught a QVC-type ad for a shower head with eight different pulses and aromatherapy cartridges you can insert into the handle and if you call RIGHT NOW, they’ll include one of those pink puffy nylon body scrubber. M was intrigued. He decided we should switch shower heads in our two bathrooms. The shower with the bathtub has the apartment’s standard-issue shower head. We bought a pulsating head for the shower stall of the master bathroom. And since we’re currently using the shower stall as a storage closet, M concluded we were wasting money but not using our nifty head. He precariously balanced himself on the edge of the tub, fumbled a little with a large wrench and then, lefty-loosey, righty-tighty, got off the small showerhead. Then he stood on the toilet lid, reached over the shower stall frame, tightened the wrench on our fancy showerhead and with one firm ratcheting, stripped the head right off its base. M looked shocked. All I could do was laugh. In all probability, the metal had fatigued and it might have broken off into the hand of the first person to use the shower again. (If we ever get out all those Rubbermaid containers.) That night, M took a “waterfall” shower without any head. But his dad insisted we put the original one back on. And I realized that something as basic as teaching M how to use an adjustable wrench falls to me. 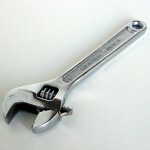 From my stagehand days, I’m able to show M how to hold and adjust the wrench with one hand. But I hate cooking. So Billy, with his culinary background, is the one who shows M how to dice onions, salute chicken and spice dishes to perfection. And if we don’t do it, who will? Parents still show their kids how to thread a needle and sew a button back on a shirt, right? And how to hold a buttercup under a friend’s chin to see if he likes butter. And how to sort the laundry. And play jacks. And sing! Ah, the joyous minutia of mothering.